To enroll in the Intern and Leadership Program and become an Apprentice, students go through an intensive interview process overseen by Lookout Conservancy staff. All students must have successfully completed their 9th grade year as part of the school’s Environmental Connections Program in partnership with the Lookout Conservancy. If a student wishes to enroll as a paid intern as part of the Intern and Leadership Program, they should contact CEO Robyn Carlton, and initiate an application process in the fall. The program application is a competitive process, given that only 8-12 students per year, out of 150, are selected due to funding constraints. Write an essay about how and why the program would benefit them as students and individuals. For many, this is a chance to experience team building, specialized academic support, leadership training and a sense of community for the first time. Provide three letters of recommendation from teachers or community members expressing how the program would be a good match for the student, and why. 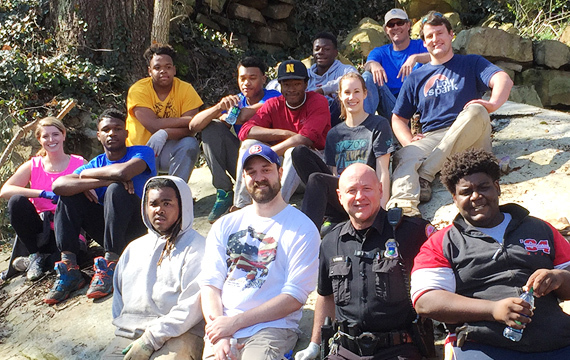 The program seeks motivated, self-aware, and open-minded students who are willing to work hard academically and physically, building trails and restoring habitat on Lookout Mountain. Submit their most recent school transcript. The transcript is used for evaluating what kind of support the student may require. Once this first phase of the application process is completed, the students are invited to complete 20 hours of volunteer time with the Interns. Upon completion of this volunteer experience, the students then interview with the Interns (fellow students who are already enrolled in the program) as well as Conservancy staff. Conservancy staff and Interns then evaluate together who they feel needs the program the most and how it would be a good match for the applicant. Once admitted to the program’s Apprentice Program, students work with the current Howard School Interns learning leadership and communication skills. As Apprentices, they also learn how to safely use trail building tools and equipment as part of their education related to trail design, ecological systems, becoming comfortable and confident in the out-of-doors, and teamwork. An academic component is also part of the Intern and Leadership Program. To remain in the Apprentice Program, students need to remain in good academic standing. Conservancy staff regularly receive updates from Howard High School and develop a plan of action with each apprentice, interns and the school to establish how they can improve, or maintain, their academic standing for athletics or a volunteer presence at the school, or for future plans to attend college. Once they complete a year, and the student wishes to remain in the overall program, they will become part of the Intern Program. The Intern and Leadership Program with Howard High School helps mentor other students (apprentices), as well as taking on additional leadership, speaking, organizational, and higher-level site improvement tasks. All Intern and Leadership Program Apprentices and Interns are paid at above minimum wage and are trained as if this is a serious job; they are expected to work over school and holiday breaks as well as during the summer. If they experience conflicts, they are expected to proactively work out arrangements with Conservancy staff. If you would like to learn more about or help out with this program, please email CEO Robyn Carlton or call 423-424-3882. Students work together on team building, leadership, self-expression, and increasing self-confidence by working to establish a trail system along the ridge of the Mountain and cleaning up the ravine. For these young adults, many have found a passion to help others and see a purpose in their school work.